KENTUCKY BELLE, by Redoute's Choice. Winner at 1200m, 3d ATC Rosehill Gardens Event Centre H., Canterbury Park H. This is her fourth foal. Her third foal is a 2YO. Her first two foals are unraced. Unmarked Bills. Winner at 2, WATC Multicultural Raceday 2YO P., 3d WATC James Boags Premium 2YO P.
Kentucky Belle. Winner. See above. Ready to Excel. 4 wins from 1000m to 1800m to 2016-17 in Aust. My Jon John. 3 wins at 6f, 1m in U.S.A.
Streetofchampions. 2 wins-1 at 2-at 6f, 8¼f in Ireland and U.S.A.
Our First Lady. Winner at 2 in Aust. MORE THAN READY (Southern Halo). 7 wins-5 at 2-to 7f, US$1,026,229, Saratoga King's Bishop S., Gr.1, Gulfstream Park Hutcheson S., Gr.2, Saratoga Sanford S., Gr.2, Belmont Tremont S., Gr.3, Churchill Downs WHAS-11 S., L, Belmont Flash S., L, 2d Belmont Vosburgh S., Gr.1, Keeneland Blue Grass S., Gr.1, Belmont Dwyer S., Gr.2, Fair Grounds Louisiana Derby, Gr.2, 3d Belmont Futurity S., Gr.1, 4th Churchill Downs Kentucky Derby, Gr.1, Aqueduct Cigar Mile H., Gr.1, Monmouth Haskell Invitational H., Gr.1. 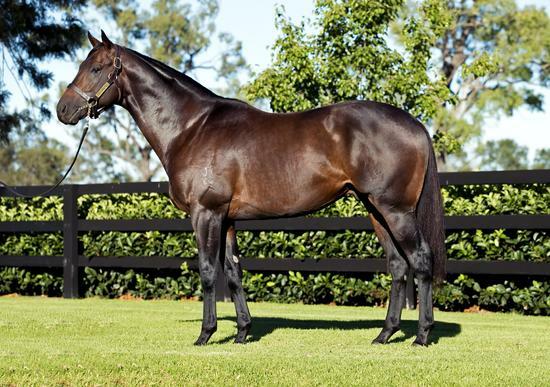 Successful sire. SHERIFF PETE (Mineshaft). 13 wins from 1000m to 2000m to 2017-18 in Peru, Monterrico Clasico Gustavo Prado Heudebert, Gr.2, Clasico Pedro Garcia Miro, Gr.3, 2d Monterrico Clasico Postin, Gr.2, Clasico Santorin, Gr.3, 3d Monterrico Clasico Claudio Fernandez Concha, Gr.3, Clasico Miguel A Checa Eguiguren, Gr.3, 4th Monterrico G.P. Nacional Augusto B Leguia, Gr.1, Clasico Laredo, L, Clasico Greek Prince, L.
RANSOM THE KITTEN (Kitten's Joy). Champion Imported Older Female in Puerto Rico in 2012. 11 wins from 1400m to 1900m in U.S.A. and Puerto Rico, Camarero Clasico Prensa Hipica, L, 4th Camarero Clasico Roberto Clemente, L.
FLY LEXIS FLY (Badge of Silver). 7 wins from 1200m to 2400m, US$257,250, 275,306S/., to 2017 in U.S.A. and Peru, Monterrico Clasico Derby Nacional, Gr.1, Clasico Ricardo Ortiz de Zevallos, Gr.1, 2d Monterrico Clasico Polla de Potrillos, Gr.1, Louisiana Downs Super Derby, Gr.2, 3d Del Mar Eddie Read S., Gr.1. STEPHANIE'S KITTEN (Kitten's Joy). 11 wins-3 at 2-from 1m to 1¼m, US$4,292,904, Breeders' Cup Filly & Mare Turf, Gr.1, Belmont Flower Bowl S., Gr.1-twice, Just a Game S., Gr.1, Keeneland Alcibiades S., Gr.1, Breeders' Cup Juvenile Fillies Turf S., Gr.2, Churchill Downs Churchill Distaff Turf Mile S., Gr.2, Saratoga Lake Placid S., Gr.2, 2d Breeders' Cup Filly & Mare Turf, Gr.1, Arlington Park Beverly D S., Gr.1-twice, Saratoga Diana S., Gr.1, 3d Keeneland Ashland S., Gr.1, Saratoga Diana S., Gr.1. BENELLI (Danzig Connection). 7 wins from 6f to 8½f, Assiniboia Downs Derby Trial S., L, 3d Assiniboia Downs Golden Boy S., L, Harry Jeffrey H., L.
Lear Flight (Lear Fan). Placed, 2d Philadelphia Park Locust S., L.
BEARCATT (Tapit). 9 wins-1 at 2-to 7f, US$209,389, Woodbine Woodstock S., L.